What the Seller Says: This is a hard to find 1950s Corduroy Jacket with printed Native Masks and a striped pattern. Snap front, a satin liner and shoulder padded. Rust colored. What we Say: Agreed. Who are we to argue with Rickykz? 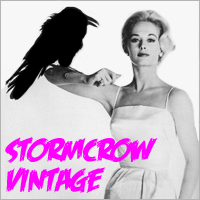 His items constantly make our round-up of the top selling vintage clothing items on eBay. Remember that $4000 vintage Reliance work shirt? Or the $3000 vintage Levi’s 501 jeans?